Roya Ensafi is on the Information Controls Fellowship Program Advisory Council. 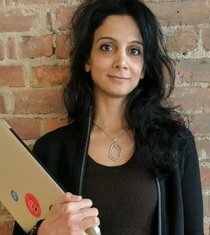 Her research focuses on security and privacy, with an emphasis on designing techniques and systems to protect users from hostile networks. She won the 2016 Applied Networking Research Prize from the Internet Research Task Force (IRTF) for her research on the Great Firewall of China. While earning her Ph.D. at the University of New Mexico, she received the Ph.D. Dissertation Distinction Award, Best Graduate Student Mentor Award, and Sigma Xi Research Excellence Award. She is a native of Birjand, Iran and enjoys climbing, biking, and basketball.